Bottom soles are slightly dirty with normal wear to heels. Insoles are slightly dirty from use. Light scuffing on inner side of left shoe. Length (Heel To Toe): 10.75". Insole Length: 10.5". Width: 3.5". Length (Heel To Toe): 9.5". Shoes are pre-owned with light wear. Bottom soles are clean. Light scuffing on sides of shoes. Insole Length: 11". Width: 3.5". NATURALIZER Adele Slip On Brown Suede Leather Ladies Shoes US Size 9.5 M ~EUC! • N5 Contour Technology For Heel & Arch Support. • 3” Block Heel. • Non Slip Outsole. I HAD LOTS OF SHOES SO YOU WON'T SEE WEAR ON THESE SHOES. EVEN THE BOTTOMS ARE VERY CLEAN. Discover feminine sophistication with the Hark heels. Faux shiny leather upper in a detailed dress style with a peep toe. N5 Comfort technology, featuring a flexible sole, lightweight materials, extra cushioning, heel-to-toe balance, and breathable lining. 4495 A1 # . Toe Shape: Round Toe. Condition: NEW IN EXCELLENT CONDITION. Bottoms of the shoes are slightly dirty and have wear. Insoles of the shoes are in good condition and have very light wear. Outsides of the shoes are in good condition and have very light wear. Length: 10". These are in very nice pre-owned condition with minimal scuffing on the leather uppers and soles / heels. The heels are about 1 3/8 high. Size 9.5 AA. 1.5" heel height. Comfy and stylish, these classy black heels are versatile and nice! · Style: Vastly 26728400. · Color: Navy Blue. Don't like the price?. The shoes you see in the pictures are the exact shoes you get. Shoes appear to be in great condition! Normal signs of wear from previous use. See pictures for more details. COLOR Brown. SIZE EU 40. Don't like the price?. The shoes you see in the pictures are the exact shoes you get. Shoes appear to be in great condition! Normal signs of wear from previous use. See pictures for more details. make Supersized seem small. Faux leather upper, balance man made. Be advised that color varies slightly from one computer monitor to another. The colors may look slightly different. Black Patent Leather upper with stylish bow on front. Man made sole. Model/Style: Loafers. Material: Leather, Synthetic. Color: Brown. COMMUNICATION PROMISE: "We Promise to Give You Our Best Effort!". in communicating with you consistently in a friendly & positive way. Comfortable dress shoes with 2 3/8" Heel. Genuine leather upper. Man made outer sole. UPPERS: The suede uppers are in excellent condition. Get these high quality shoes here at a great price! Genuine leather upper. Rubber outer sole. New, never worn with original box. Naturalizer Portfolio peep toe pump. Strap and buckle across toe. Brown leather with beige fabric. Stacked heel. Size 9.5 M US. Any size conversions (US, EUR or UK) not provided by manufacturer was made using asknumbers or zappos. Color: Brown. This listing is for one pair of womens size 9.5 Naturalizer brown suede Mary Jane pumps that are in excellent condition. These shoes feature a faux buckle (they are slip on), a cream stitch design and comfortable rubber outsole. The height of the heel is 2.5 inches. Please see all photos for the best description. Please look at the wide variety of other items I have listed and if you are interested in anything please contact me for a discount. These beauties are offered with free shipping. If you have any questions please feel free to email me. Thank you for viewing this listing. N5 Comfort. This delightful pump is a sweet addition to your dress wear featuring a gorgeous patent bow on the capped toe. It has a comfortable mid height heel and uses Naturalizers N5 comfort system with a manmade outsole. Natural Soul by Naturalizer "Breman" Black Leather Slide Sandal w/ 3.25" Heel. Size 9.5M. Previously owned but used only once, leather uppers present "as new", as do the non-slip soles, while the heels reveal the minimal trace of a single usage. Naturalizer N5 Comfort. There is sticker residue on right shoe bed and a faded "N" on the N5 on the footbed. Otherwise they are perfectly new! Black Patent Faux Alligator Pattern/texture. Really nice. 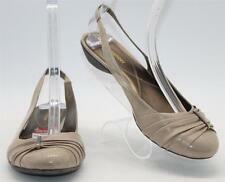 Naturalizer N5 Comfort Demand heels shoes. Excellent - Only slight signs of wear. Does not diminish the overall appearance of the item. 3" stacked heel. Good - Shows signs of regular use. Item shows visible wear.